Book Condition: Worn edges and covers and might have small creases. Item is free of any major damage. Might have a moderate amount of markings on the pages. Might or might not be ex-library or missing its dust cover. Otherwise item is in good condition. Returns are easy and welcome if this item is not as expected! Comment: Worn edges and covers and might have small creases. Item is free of any major damage. Might have a moderate amount of markings on the pages. Might or might not be ex-library or missing its dust cover. Otherwise item is in good condition. Returns are easy and welcome if this item is not as expected! Ptolemy's Almagest is one of the most influential scientific works in history. A masterpiece of technical exposition, it was the basic textbook of astronomy for more than a thousand years, and still is the main source for our knowledge of ancient astronomy. This translation, based on the standard Greek text of Heiberg, makes the work accessible to English readers in an intelligible and reliable form. It contains numerous corrections derived from medieval Arabic translations and extensive footnotes that take account of the great progress in understanding the work made in this century, due to the discovery of Babylonian records and other researches. It is designed to stand by itself as an interpretation of the original, but it will also be useful as an aid to reading the Greek text. Before buying Ptolemy’s Almagest (written around A.D. 150) I knew of its reputation as a highly technical and difficult text on Greek geocentric astronomy. Still, the extremely thorough treatment by Ptolemy with all its details surprised me, and I really admire the achievements by Ptolemy and his ancestors. I couldn’t have done much progress without two excellent commentaries. Olaf Pedersen’s “A Survey of the Almagest” (with annotation and new commentary by Alexander Jones, Springer, 2010) was very helpful in revealing the mathematical aspects in Almagest. Even more important for me was James Evans’ “The History and Practice of Ancient Astronomy” (Oxford University Press, 1998) since Evans both explained the historical background of Almagest and helped in several mathematical details. An armillary sphere would also have been very helpful in getting a concrete view of the rotations. I didn’t have it, but I made a primitive prototype from a metal wire. With the help of these tools I managed to get a fairly clear picture of the Books I-IV, ca. 200 pages on Ptolemy’s mathematical tools and on solar and lunar motions, in ca. 2.5 months (after normal working days and on weekends). Thereafter, I spent ca. 3 weeks for a fairly superficial overview of the rest of the book. I got what I wanted: a basic understanding of Almagest. It was just what I needed for my college class. The main desire of Ptolemy in writing his Almagest is to explain and account for the motions of the apparently erratic celestial beings in terms of perfect and circular motions. In doing so he introduces the epicyclic (which states that the center of a smaller circle orbits around the earth and the object orbits around the smaller circle) and the eccentric hypotheses (which supposes that the center of the circular motion of the planet is not exactly centered on the earth), which are ultimatly equivalent to eachother in terms of result. Begining with the motion of the sun in the sky and moving on to the less accountable outer planets, Ptolemy moves his mathematics brilliantly with a nod to a story teller's art. Some may find his introduction of his equant (something that is often said to defile his principles of perfect motion), which explains the retrogradation of the outer planets, to be a let down to the fanfare of perfection in the stars. Yet, overall, the Almagest manages to recapture the magic and wonder of the universe through complicated mathematical hypotheses and to succesfully lay the ground for the break throughs of Copernicus, Brahe, and Kepler to come. If you are at all interested in astronomy or mathematics, you ought to read this. Adding to the other comment below about star names beginning with "al-," I might add that the title "Almagest" itself is an Arabic translation of the original Greek "Megale Syntaxis." 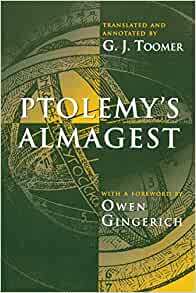 5.0 out of 5 starsPtolemy's "Almagest"
It's a very interesting astronomy book, it's explain how they've thought about the motion of the planets(epicycles)in the past(AC)by the time of the Ptolemy and Babylonia. so it turns out that the center of the eccentric circle that the planets travel on travels on its own circle but be careful this is not a giant epicycle on a small deferent! haha! genius! !